All the drawers used to look like the drawer on the top left, the one that's sort of a dull grayish blue with funky gold paint curlicues that form (in my mind) some sort of hands-on-hips conquistador. I wanted something more whimsical, more colorful, and more cheerful. The drawer on the bottom left -- the one with the USB cords disappearing into it -- is for what I call "iStuff": iPods, iPhones, etc. Hence the eyes. 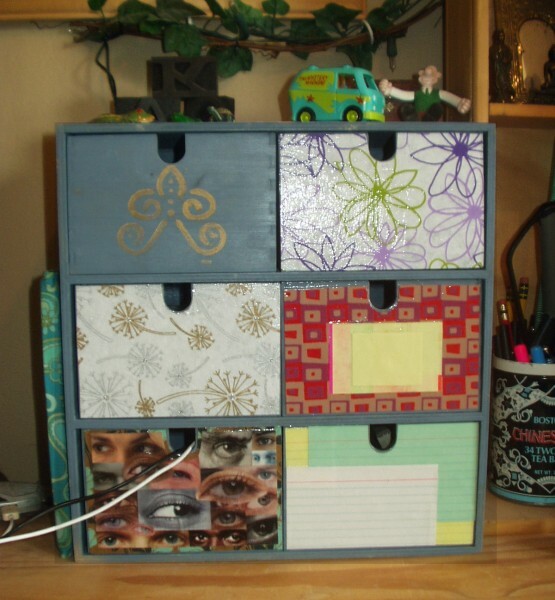 The drawer on the bottom right is for index cards and other similar things, while the drawer above it is primarily for Post Its. Aside: On top of the set of shelves, you may also notice a tiny Mystery Machine and a flexible plastic Wallace (but sadly no Gromit), among other small items (including some dark squarish blobs on the left that are blocks of wood type with my initials on them).